WASHINGTON (JTA) — The U.S.-Israel alliance and the need to keep Iran from acquiring a nuclear weapon were major themes in the final presidential debate before the Nov. 6 election. Both President Barack Obama and Mitt Romney said Monday during their foreign policy debate that they would stand with Israel in an attack by Iran. Along with Iran, China, Afghanistan, Syria and Pakistan, Israel was among the most mentioned countries at the debate. Obama, who has faced attacks from Romney on his approach to Israel, was the first to mention the Jewish state when he outlined at the beginning of the debate how he was dealing with the unrest roiling the Middle East. “I think the tension that existed between Israel and the United States was very unfortunate,” Romney said in arguing that he would better stand by U.S. allies. Israel returned as a topic in one of the debate’s most heated exchanges when Romney reminded Obama that he had not visited the country during a 2009 Middle East tour. Obama responded by first noting that he had visited Israel and U.S. troops abroad as a candidate — a reference to criticism of Romney for not visiting troops during his campaign travels abroad. He also attacked Romney for organizing a fundraiser during his own Israel trip in July. “And when I went to Israel as a candidate, I didn’t take donors, I didn’t attend fundraisers, I went to Yad Vashem, the Holocaust museum there, to remind myself the — the nature of evil and why our bond with Israel will be unbreakable,” Obama said. 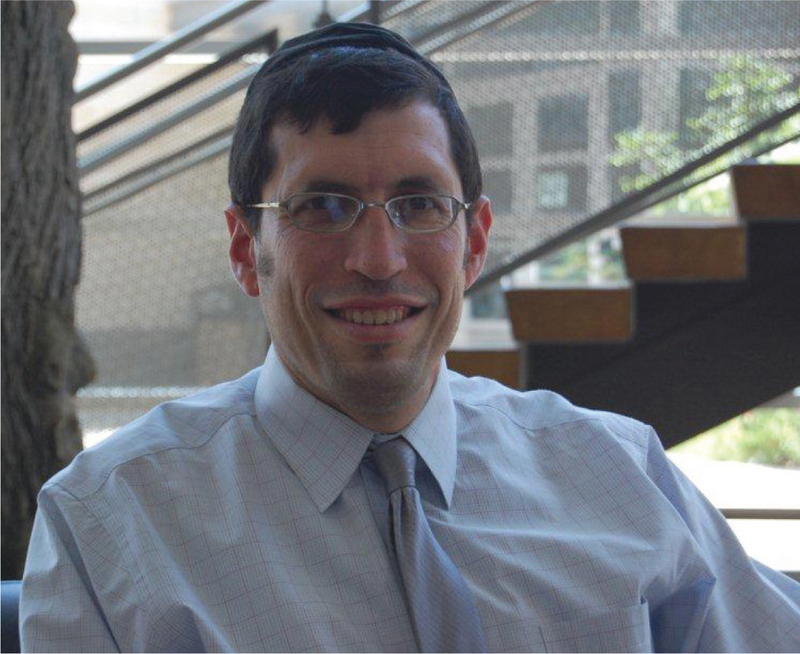 Author’s note: Rabbi Israel Lashak, the director of DATA’s JEX College Program and regional director of NCSY, received several penetrating questions from a student who attended one of his recent Israel trips. He forwarded them to me, and we shall spend the next few columns addressing the thoughtful questions of this deeply thinking young man. My thanks to Rabbi Lashak for sharing these wonderful questions with me and all of you. a). Does one need to believe in the Jewish God to go to heaven, or can one just be a good person? b). In the afterlife, do people still have the free will to do good or bad things? If so, then are there any punishments in heaven for bad deeds? c). You said that the inevitability of death gives meaning to our lives here on earth. Since we know we’re going to die someday, we have to make the most of the precious little time we have here on earth. But if our souls will experience an eternal afterlife, does their existence become meaningless then? I don’t get it. a). We believe that all goodness flows from God, the creator of goodness. Heaven is nothing other than a place where people connect to God on the deepest level; that connection itself is the very reward of heaven. The Jewish belief is that one will not be able to enjoy closeness to God in heaven unless he or she believes in the very God they will be connected to there. Heaven only works for those who believe in it, and without God, there is no heaven. b). We believe that free choice only exists in this world. The years of life in this world that are allotted to each individual are his or her sole opportunity to make choices. Heaven is the place we receive the reward for the choices we made in this world. It is only a place of reward, not a place for choosing or performing new good or bad deeds. c). The meaning of life in this world is very different than that of the afterlife. What I believe Rabbi Lashak meant was that this world is fraught with struggles between good vs. evil, right vs. wrong, laziness vs. the fortitude to work hard to do the right things. It is also filled with a lack of clarity as to what is, indeed, the right or wrong thing to do in many situations. There’s often great confusion as to the purpose of life itself. The inevitability of eventual death forces us to clarify and crystalize our thoughts and find a clear path and purpose, because we know we don’t have forever to keep groping in the dark. This will lead us to making the most of our time here. The afterlife, which has none of the above obfuscation, carries its own purpose and meaning as a place of eternal reward without the need for a sobering message of an end to come. An important part of Judaism is the concept of l’dor v’dor — from generation to generation. On Friday, Oct. 12, this concept was very much in evidence at the Lil Goldman Early Learning Center, as students and seniors gathered for an early Shabbat celebration. Sukkot and Simchat Torah also were observed. Teachers, students and guests of all ages participated through blessings, songs and dance. The seniors also received a special gift from the students: Wonderfully decorated Shabbat placemats and cookies the young children helped bake. Thanks to Debby Rice for sending us this information — and the wonderful accompanying photos. And thanks to the Lil Goldman Early Learning Center for teaching the mitzvah of welcoming to the younger generation. Elizabeth Cohen recently wrote us about 13-year-old Ted Herman. Ted, an eighth-grader at Trinity Valley School in Fort Worth and the son of Congregation Ahavath Sholom members Martis and Chad Herman, wrote an award-winning essay for a school contest. Lydia Gershman shows off her placemat at the Lil Goldman Early Learning Center at Congregation Ahavath Sholom. His reward was participation in a wreath-laying ceremony at the Tomb of the Unknown Soldier at Arlington National Cemetery near Washington. His parents accompanied him at the event, which took place Oct. 2. Congratulations go to Ted, to his parents and to his grandparents, Suzanne and Ben Herman of Fort Worth and Steve Okon of Dallas. 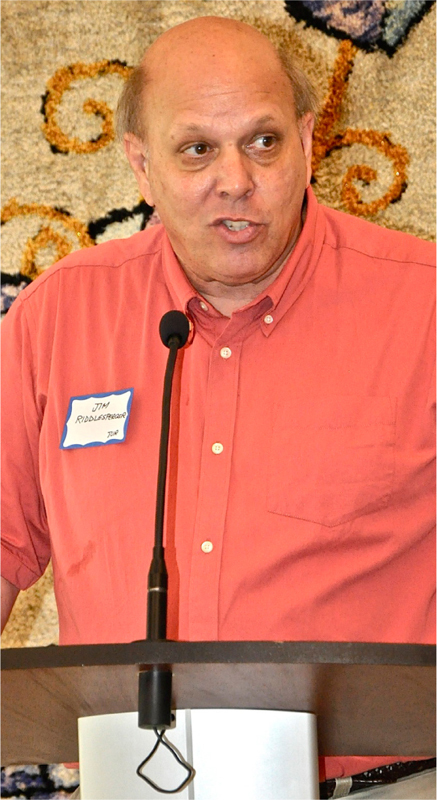 Barbara Rubin tells us that more than 40 participants showed up on Oct. 17 to listen to Jim Riddlesperger as he presented national and location election facts at the most recent Daytimers event. One interesting fact he shared is that more than one million voters have already cast ballots through early voting. Other issues discussed included the Electoral College process, polls and the difference between a pollster versus a political campaigner. For information and reservations, call Barbara at 817-927-2736 or Larry Steckler, 520-990-3155. 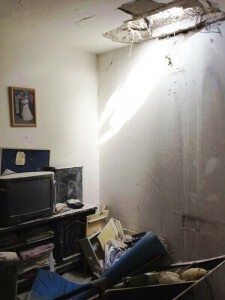 You can also reserve your space by logging onto www.bethelfw.org/donations. The B’nai B’rith’s outstanding person of the year celebration will take place at 6 p.m. Sunday, Oct. 28, at Congregation Ahavath Sholom, 4050 S. Hulen St.
Goga Denisov will provide music for entertainment with dinner consisting of kosher Russian food and wine. The cost for the evening is $25, and vodka and caviar add-ons are available. Contact Harry Kahn, 817-926-6566; hskdsk@charter.net; Alex Nason, 817-346-3991, alexnason@charter.net or Marvin Beleck, 817-921-2438, marvinbeleck@aol.com to make your reservations or for information. Chabad of Arlington presents “A Pastor’s Journey to Judaism” at 6:30 p.m., Sunday, Nov. 4 at the Arlington Sheraton, 1500 Convention Center Dr. The “pastor” in question is Yaakov Parisi, formerly Pastor Jack Parisi who, with his wife, made the long journey from Evangelical Christianity to Judaism and now lives in Israel. The cost is $20 for advanced tickets and $25 at the door; sponsorships are available. For information, log onto arlingtonchabad.org. Shoshana Abrams, cantor at Congregation Ahavath Sholom in Fort Worth, and Sheri Allen, cantor at Congregation Beth Shalom in Arlington, will be the guests at the next Fort Worth Hadassah event: “Shir and Schmooze with Shoshana and Sheri,” which will take place from 4:30-6 p.m. Sunday, Nov. 11, at the home of Etty Horowitz, 6628 Sahalee Dr. in Fort Worth. Wine, cheese and light refreshments will be served. Also on hand will be Rhoda Bernstein and Laurie Werner, both former Fort Worth Hadassah presidents, who recently came back from Hadassah’s Centennial Celebration in Israel. They’ll discuss the newly dedicated Madlyn Barnett Healing Garden in the new Sarah Wetsman Davidson Hadassah Hospital. Admission is $10 per person, payable at the door, but please let Jane Pawgan know by Nov. 7 by calling her at 817-292-5778 or emailing her at drjaneguzman@aol.com. To thank the Tarrant County Jewish community for its support, The Jewish Federation of Fort Worth and Tarrant County is sponsoring Craig Taubman, live and in concert at 7 p.m., Saturday, Nov. 17 at Beth-El Congregation, 4900 Briarhaven Road. The concert is free, and Taubman is known, among other things, for his “Friday Night Live,” music composed for monthly special services at Sinai Temple in Los Angeles. Questions? Interested? Contact Angie Kitzman at 817-569-0892 or at a.kitzman@tarrantfederation.org. I try to keep news about the Sorter family to a bare minimum, but I wanted to brag a little about Young Sorter and encourage readers out there to see the musical “Ragtime” at Plaza Theatre in Cleburne. Michael Sorter has a nice role in the play. More importantly, “Ragtime,” devotes a part of its story to American immigrants and their struggles during the early part of the 20th century. A slice of the production focuses on real-life Jewish immigrant, feminist and anarchist Emma Goldman, who emigrated from Lithuania to the United States in 1885. Also highlighted is a fictional character, Jewish immigrant Tateh and his family, and the struggles and bigotry he undergoes as he attempts to assimilate into American culture. The performance is emotional and moving, and well worth the trip to Cleburne. The show runs through Nov. 17. Or at least to keep the emails flowing. I’m interested in news from the Tarrant County area —parties, trips, awards, etc. Send ‘em on! I am, as always, at awsorter@yahoo.com. Each year, I make sure to comment on a very special “American” holiday. Oct. 31 is a holiday that we do not celebrate at most Jewish schools. Halloween is not a Jewish holiday, and the religious aspects of the day have been long forgotten. Halloween, also called All Hallows Eve, is the eve of All Saints Day. All Saints Day had its origins in the year 837, when Pope Gregory IV ordered the Church to celebrate a day in honor of all saints. Over time, the holiday focused on witches, death, skeletons, etc. Today, however, the day is very much an American experience for most of us. The roots of the day have long been lost yet the debate among Jews continues. How you choose to handle this holiday is a family decision but I do have my yearly recommendation. On Nov. 1, rush to every store that sells costumes and get great ones for dress-up and especially for Purim — our time to dress up. The sales are fantastic. To hear from Miriam Creemer is always a joy. If you know the effervescent yiddishe mama, you know what I mean. She’s just plain fun to talk to, and it’s hard not to smile. I must admit, I was more than a bit concerned when she phoned me last week and said, “Sharon, guess what, in honor of breast cancer awareness month, I decided to get a mastectomy.” My jaw dropped. I knew Miriam was a cancer survivor for more than two decades. We did a report in the TJP years ago, on lymphedema, one of the grueling side effects of her lumpectomy many years ago that she and others suffer from. I did not know, however, that she had a recurrence. In her own ebullient way, Miriam had not called to lament about her recent surgery. 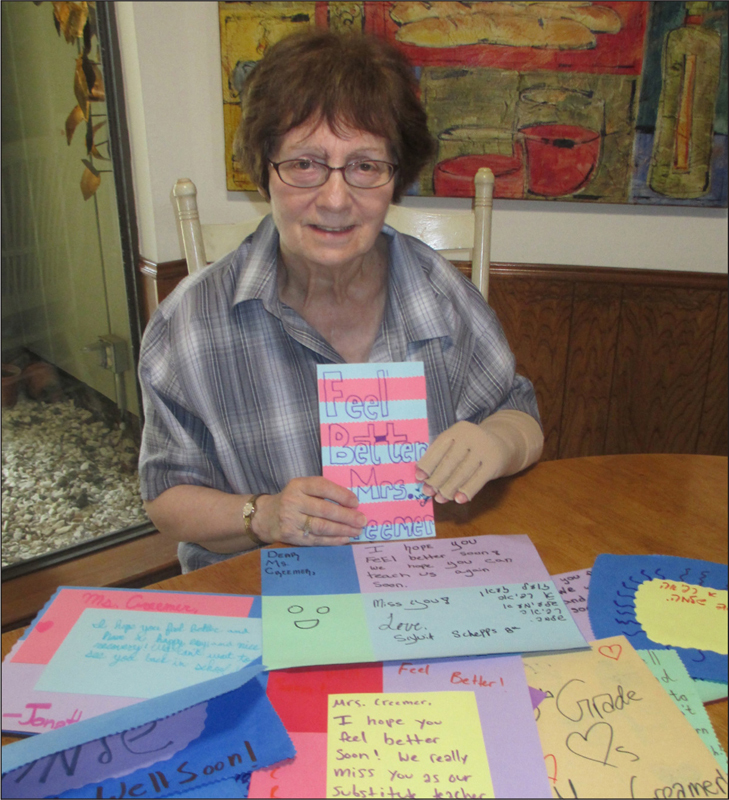 She wanted to share with our readers how she had received a sheaf of homemade cards from students at Akiba Academy, where she has been a substitute teacher for many years (she told me she answered an ad in the TJP for that position. Go Miriam). Her remarks were so sincere, I had to see the cards for myself, and you know what? She’s right. 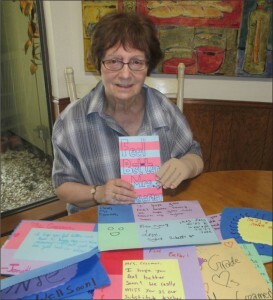 These were not an afterthought, but an outpouring of love from her students of all ages. Kudos to everyone at Akiba who had a hand in brightening Miriam’s recovery. Miriam has been recovering well. As we sat around her kitchen table, surrounded by her astounding menorah collection, Miriam was kind enough to remind me how she landed here in Dallas from Calgary via Paramus, N.J., and became the senior director at the JCC for 20 years before her retirement in 1999. Miriam’s husband, Al, worked for Mobil and was transferred to Dallas. Their children, Roz and David, enrolled at Pearce High and Westwood Junior High, respectively, and Miriam immediately phoned the JCC. She had been working with seniors in Paramus, and the rest, as they say, was history. 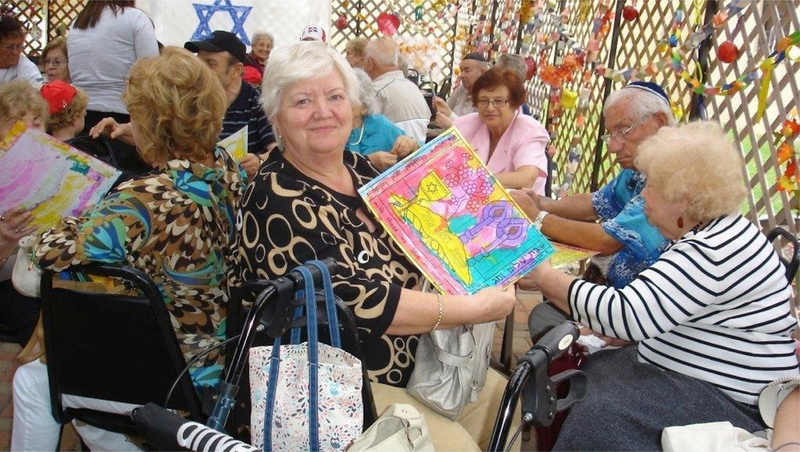 Miriam and Al still lead trips around the world for seniors at the Paramus JCC. The Creemers are long-time members of Congregation Beth Torah in Richardson. Miriam shared with me how lucky she was that they caught her cancer when they did. She reported that an astute mammographer noticed that her film didn’t look quite right and went the extra mile to make sure that she got the image she needed to detect the half-inch tumor under her left breast. Miriam had her surgery on Sept. 27, the day after Yom Kippur. All of your friends here at the TJP wish you a continued speedy recovery, Miriam. And to all the honorable menschen at Akiba who wrote those beautiful cards, Yasher Koach. Back in the day, the TJP was not fortunate enough to have a recipe developer that contributed amazing weekly recipes. Thus, the task of developing the recipe column fell on my mother, Rene, ahavah shalom’s shoulders. 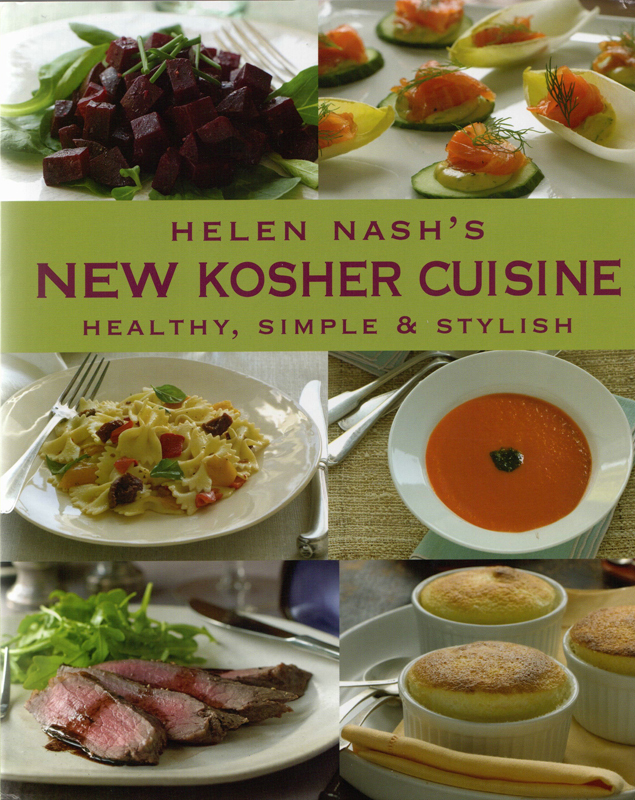 A tasting menu from “Helen Nash’s New Kosher Cuisine,” will be part of the author’s presentation at the J Book Fair on Monday, Oct. 29. The TJP had quite an extensive cookbook collection, and mom poured over those and the new ones that arrived to develop just the right mix each week. Two of her favorites in the ’80s were Helen Nash’s “Kosher Cuisine,” followed by “Helen Nash’s Kosher Kitchen,” both lauded as a new approach to kosher cooking at the time. 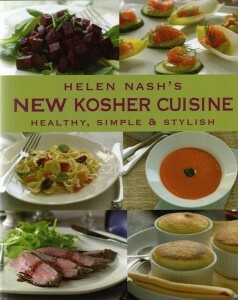 Nash has just published a new book, “Helen Nash’s New Kosher Cuisine” (Overlook Press Hardcover, $35). Her new cookbook takes the art of kosher cooking to a new level by adding the dimension of being healthy without sacrificing her old-country roots. Nash will appear at the J Book Fair at 7 p.m. Monday, Oct. 29. Cost of the event is $18 and includes a tasting menu. She will also sign copies of her book. Nash was born into an old rabbinical family in Krakow, Poland. In New York City, where she has spent most of her life, she studied with world-famous cooks Michael Field, Marcella Hazan, Lydie Marshall and Millie Chan. An accomplished lecturer and teacher, she has given demonstrations at New York University, Yeshiva University and the De Gustibus cooking school at Macy’s, as well as at numerous synagogues and Jewish community centers. As Breast Cancer Awareness Month winds down, I wanted to remind readers that JFS has an ongoing breast cancer support service. Earlier this month, JFS hosted the Bridge Breast Network mobile unit that provides free mammograms for women who are 40-plus years old and uninsured. Twenty-four women received free mammograms and follow-up support. Incidentally, at 10 a.m. Sunday, Nov. 11, Congregation Ohr HaTorah will hold a walk to raise breast cancer awareness. The $5 registration fee will benefit JFS’ cancer support services. The walk begins at Ohr HaTorah (6324 Churchill Way in Dallas) with after-walk activities including speakers, a raffle and more. Register for the walk at www.ohrhatorahdallas.org/Cancer_Walk-a-Thon.html. For information about the Ohr HaTorah walk or any of JFS breast cancer services, contact Beth Broodo, director of breast cancer services at bbroodo@JFSdallas.org or 972-437-9950. In last week’s column I inadvertently typed that the DATA of Plano event with Rabbi Yosef Medelevich would be held on Oct. 20. In truth it is slated for 8 p.m. Tuesday, Oct. 30. As a reminder, Medelevich will share his refusenik experience, and the event will be held at DATA Far North’s new location, 7130 Campbell Road, Ste. 204. We would like to hear from our readers. Send you news and photos to me at sharonw@texasjewishpost.com or 7920 Belt Line Road, Ste. 680, Dallas, TX 75254. If you prefer, pick up the phone and call me at 972-458-7283. I’d sure love to hear from you. Here’s something about my late old friend Al: He had 30 years on me when he retired and moved to California. We’d long shared a mutual love of reading, so when he made his first return visit and I asked him how he was filling all those work-empty hours, I expected he’d tell me it topped his activity list. And so it did, but not in the way I expected. “I go around to some of my area’s senior centers, reviewing books and telling stories to the old folks,” he said. Old folks? I laughed then, because he was surely one of them himself. Well, today I’m not laughing, since I think I may have turned into Al. I’m now about the age he was when he opted for retirement, but I find it hard — impossible, actually — to think of myself as one of the “old folks” because, like he did, I go around to some of our area’s senior centers, reviewing books and telling stories to their residents. The Expo’s presenting sponsor, Town Village North, was one of the first senior residences to open in our area; its central location with proximity to the “J” made it a prime pick for older Jews looking to give up their houses but not their joy in living. Here they found good friends, good food, and good times. Since Town Village opened, it’s almost impossible to count how many other housing options have come here. I call this modern phenomenon — born, of course, from the same lengthening lifespans that have brought our country up short where Social Security and Medicare are concerned — “the growth industry of our time.” At Expo, lots of senior facilities set up autumn-decorated tables covered with informative brochures and plenty of tasty treats for folks to munch on as they walked, looked, talked and learned. Dallas Seniors’ Guide is a hefty free brochure: almost 100 colorful pages covering virtually everything of interest and importance to “old folks.” John and Antoinette Griffin publish similar localized guides for other Texas cities, too; the one I picked up at Expo to take home, their sixth annual for our area, had been mailed earlier to an astounding 75,000 homes. And at Expo, everybody could face up to those important, scary, too often ignored end-of-life issues in a safe, upbeat atmosphere. People were there to share information on hospice care; so were compassionate representatives of those who provide Jewish funeral and burial services. It’s not so intimidating to look honestly at life’s inevitables and learn about their realities in a companionable setting like this. Expo set a festive casino theme with game tables, slot machines and bingo, everything played just for fun, and fun prizes awarded rather than money. This was exciting for some. But what was exciting for everyone is the JCC’s new offering: “Senior Social J,” a special category for all in our area who are at least 65 years of age; it will provide a range of both in-house and off-site activities for an annual membership fee of just $44. This will allow many more “old folks” to take advantage of the JCC’s growing senior program at an amazingly reasonable fee. My old friend, whose informal teaching made him a special kind of “senior helping seniors” himself, would have loved this budget-friendly idea. I do, too. And in my own “old folks” years, I’ll support it (while, of course, I continue for as long as I can to follow in Al’s footsteps, reviewing books and telling stories to my contemporaries). One of my can’t-miss fall adventures with the boys is attending Truck Time at Congregation Shearith Israel, and we’ve cleared our schedule for this Sunday, Oct. 21. 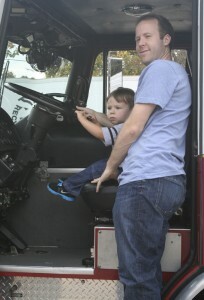 From 10 a.m.- 2 p.m., you can check out all of the trucks at this year’s Champion Energy Truck Time 2012. Bring your family, neighbors and friends to enjoy the day of trucks, bounce houses and vendors, plus kosher food available for purchase from the K-Wheelz kosher food truck. All proceeds support the activities of the CSI Family Center. More than 2,000 people attended last year. Cost is $5 per person; free for ages 2 and younger. Truck Time 2012 is an opportunity to show our kids how to participate in tikkun olam, or repairing the world, by helping us “go green.” All recyclable items from the event will be collected in bins and put in the recycling truck in CSI’s parking lot. Be sure and bring old clothing to be recycled by United Southern Waste Material Company. New this year is a collaboration with Jewish Family Service’s Special Needs Partnership. Families with special-needs members are invited to attend a light breakfast at 9 a.m. and a truck preview at 9:30. A quiet room will be available throughout the event. For information about the early festivities, contact Teri Kachur, community organizer of JFS Special Needs Partnership, at TKachur@JFSDallas.org or 972-437-9950. Event co-chairs Ellen and Ari Bond, Gretchen and Avi Edwards, Stephanie and Barry Grossman, and Blair and Matan Wolfson are working hard to make this event a success. For volunteer opportunities, contact Suzanne Minc at SMinc@shearith.org. For information, visit www.shearith.org. Here’s a Truck Time tip: Don’t forget your camera, there are tons of bar/bat mitzvah montage-worthy photo ops at this event. Thanks to Harriet Gross, who shared the following tidbit with us about her childhood friend, Frankie Schwartzwald. “Frances ‘Frankie’ Schwartzwald of Grand Prairie, whose impassioned support of Israel often finds its way into print, has been named ‘Letter Writer of the Year’ by CAMERA, the Boston-based Committee for Accuracy in Middle East Reporting in America. She will be honored with a plaque presentation at a dinner in late April 2013 in New York. The J Players will perform “Titanic the Musical” on Feb. 23, 24 and 28, and March 2. Auditions will be held from 6-10 p.m. on Sunday, Nov. 18, and 7-10 p.m. Monday, Nov. 19. Callbacks will be 7-10 p.m. Tuesday, Nov. 20. All auditions will be held in the Zale Auditorium of the Aaron Family JCC, 7900 Northaven Road. Rehearsals will begin on Jan. 13. Requirements: Prepare 16 bars of an upbeat number from traditional musical theatre (accompanist provided). There will be cold readings from the script. Also, please bring current photo/resume. To schedule an appointment, call 214-239-7115 or 7112. Many of us take freedom of religion for granted. For Rabbi Yosef Medelevich, who was instrumental in glasnost, nothing could be farther from the truth. Born in 1947 in Riga, Latvia, Medelevich was a leader of the Russian Jewish revival in the 1960s. He was arrested in 1970 for attempting to hijack a Russian airplane to escape and served 11 years in the Soviet gulag for his Jewish activism. Medelevich is credited with being instrumental in the fight that opened the doors for Jews to leave Russia. He has lived in Israel since his release in 1981 and received his rabbinic ordination and a master’s degree in Jewish history there. If you’d like to learn more about Medelevich’s gripping story, check out the DATA program, “To be a free Jew: My experience and struggle for human and Jewish freedom” at 8 p.m., Tuesday, Oct. 20, at DATA Far North, 7130 Campbell Road, Ste. 204. This is a new location for DATA Far North and it’s located behind Natalie’s Kitchen at Campbell and Hillcrest. Cost is $10 for those pre-registered and $15 at door. To register, email nzakon@dataofplano.org or call 214-987-3282. The program is co-sponsored by DATA Far North and DATA of Plano. Local Jewish teens whose volunteer service projects demonstrate a determined commitment to make the world a better place may compete for awards of up to $36,000 in the Diller Teen Tikkun Olam Awards, which is expanding nationally for the first time. Up to 10 teens, five from California and five from other U.S. communities will receive the grant to further their philanthropic work or their education. Deadline for nominations is Jan. 6. The Helen Diller Family Foundation, based in the San Francisco Bay area, began the program in 2007. The Jewish Federations of North America is collaborating with the foundation to bring it nationwide. Teachers, community leaders or rabbis — but not family members — may nominate candidates. Teens may nominate themselves. Each candidate must be a U.S. resident age 13-19 and must self-identify as Jewish. 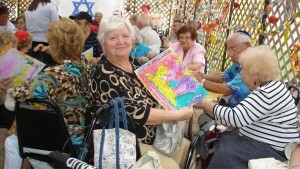 The project can benefit the entire or Jewish community. To enter, complete the online nomination form at www.jewishfed.org/teenawards/process. For information visit www.jewishfed.org/diller/teenawards; call 415-512-6437; or email dillerteenaward@sfjcf.org. • Jewish Family Service has announced it will open a resale store in Richardson. Stay tuned to next week’s TJP for more information about drop-offs and pickup, or call 972-437-5300 for more information. • The Jewish Federation of Greater Dallas has announced that the keynote speaker for the 2013 Women’s Event is Jean Chatzky, financial editor for NBC’s “Today Show.” The event will take place on Thursday, Feb. 28. Event co-chairs are Stacey Baer, Cheryl Gardner, Susan Levy and Melissa Plaskoff. • Remember, Bnai Zion will honor David Genecov and pastors Tiz and Larry Huch on Sunday, Nov. 4, at the Westin Galleria. Gala chair is Stacey Clark; gala co-chairs are Diane Benjamin and Shirley Strauss; honorary chairs are Jack and Janet Baum and Jeff and Lisa Genecov. The honorary gala committee consists of Sally Genecov, Mike and Ann Ochstein, John and Kimberly Ross, Rob and Julie Shrell, Andy and Lynne Siegel, Barry and Alyssa Wernick, and Stuart and Sheryl Wernick. All proceeds from the evening benefit Bnai Zion Medical Center. You can register online at www.bnaizion.org/pay_dallas2012.php?pay=1 or contact Avrille Harris Cohen at 972-918-9200 or avrille.harris-cohen@bnaizion.org. • Dallas independent filmmaker Cynthia Salzman-Mondell will be honored for her body of work at the second annual Lois Weber Film Festival. The festival, which screens movies and documentaries by female directors, is hosted by the Grand Prairie Public Library and held at Grand Prairie’s Uptown Theater. At 7:30 pm on Friday, Oct. 19, the Library will award Salzman-Mondell the Lois Weber Award, for her impact on the Texas motion picture industry. Her movie “The Ladies Room” will be screened. • You can still participate in the inaugural Lois Goldblatt Memorial Mah Jongg Tournament at 10 a.m., Oct. 28 at Ann and Nate Levine Academy, 18011 Hillcrest Road. Cost is $36 and includes lunch and prizes. For information, contact Joanne Goldblatt at info@theryangoldblattfoundation.org or visit www.theryangoldblattfoundation.org. Your last answer was nothing I haven’t heard or tried to believe. Anyway, I’m not looking for answers. At this point, questions do a lot more for me then answers. As you know, Judaism does, and always has, welcomed questions with open arms. The entire Talmud, the foundation of all Jewish thought and practice, is filled with questions. Pesach, the celebration of our birth, freedom and peoplehood, features the seder, which begins with the Four Questions, inculcating into the minds of our children from the most tender age that we are a people who ask questions. Moses presented difficult questions to the almighty Himself, such as “ … my Lord, why have You brought evil upon this people, why have You sent me?” (Exodus 5:22). Abraham, after being told not to slaughter his son Isaac on the altar, brought a difficult question to God: How could He present him with two contradictory commands and contradict His own promise? (See Rashi to Genesis 22:12). God does not get upset with either Moses or Abraham for their questions; He simply answered them. This is in powerful contrast to most forms of Christianity and many other religions, which at best don’t encourage questioning and, in most cases, discourage questions completely and consider a seeker or questioner to be a blasphemer. Many who have approached me considering conversion to Judaism cited this as a key motivating factor for their decision to pursue Judaism. They have been put into some level of excommunication or have been shunned by their religious leaders and their families because they have questions and are seeking answers. They have seen in Judaism the exact opposite attitude, one that welcomes the challenge of questions, apparent contradictions and those individuals seeking truth and deeper meaning, even when those questions challenge the very foundations that Judaism is based upon. A rabbi explaining why the seder begins with questions presents another spin on this. Imagine a Jew has thought of a novel explanation of a verse and told it to two friends. One thanked him for the nice thought; the second was jumping up and down out of joy. The second friend had a question on that verse that was bothering him for years; the new explanation answered his question. This rabbi points out that many times, much more than the question needs an answer, the answer needs a question. At times we Jews, and I think this is what you are feeling, express our frustration by questioning. I think this can be good, with one caveat. I will illustrate this with a story of a student of the famed dean of the yeshiva world from the early part of the last century, Rabbi Chaim Soloveitchik. Reb Chaim had a student whom he had heard had later “left the path” of Torah observance. This student was passing through the city of Brisk and, out of respect, went in to visit his former rebbe. When R’ Chaim saw him, he exclaimed, “I heard you … you … you … ” and was speechless. The man said, rebbe it is true, I am no longer observant, because of three questions I have that don’t allow me to observe the Torah, and if the rebbe will answer the questions, I would be more than happy to return. R’ Chaim said, “I will be happy to answer your questions, but I first have a question. Did you ‘leave the path’ after you were bothered by these questions, or did you first leave and think of the questions later?” After a moments thought, the man replied that he, indeed, thought of the questions after he had already left his observance. R’ Chaim replied that he cannot answer these questions, because he can only answer a question, not an answer. “Your questions are not questions, rather answers,” meaning, they’re a justification for what he was doing and not a real question seeking an answer. That is my caveat: Questions can be good on their own right for a time to get our feelings off our chest, but we can’t allow that to go on for too long, otherwise our questions become transformed into answers, and there are no answers for answers. Akiba Academy of Dallas officially opened its doors with 23 students in September 1962. 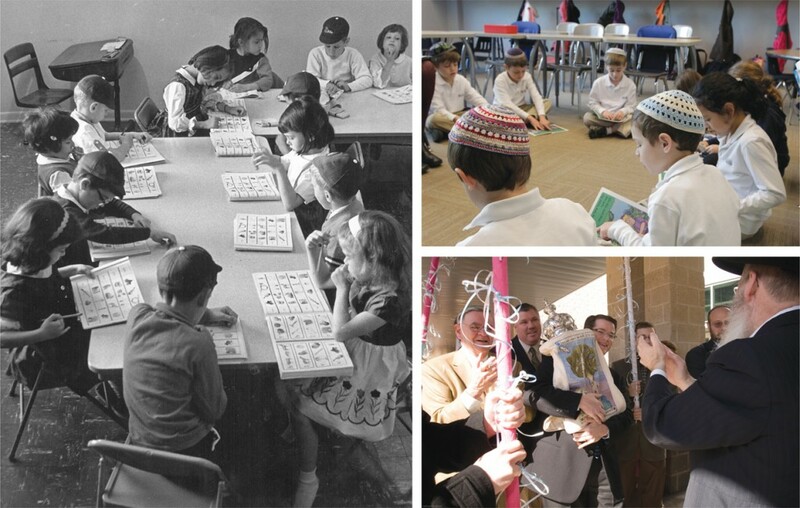 Fast forward 50 years, and the Modern Orthodox day school now boasts 368 students from all sects of Judaism, has classes in a shiny modern facility and has became a face for Jewish education in the community. The school will celebrate its 50th anniversary at its annual gala at 5 p.m. Sunday, Oct. 28 at the Westin Galleria, 13440 Dallas Pkwy., in Dallas. Past galas have honored specific individuals in the community, but this time, the school itself is the honoree, according to gala co-chairs Adriana Meyerovitz and Peta Silansky. A live and silent auction, and music will be featured, and Rabbi Mendel Bernstein, Akiba’s first head of school, is expected to attend. Many Akiba graduates are treating the event as a reunion of sorts, Meyerovitz said. The gala will kick off the 50th anniversary celebration, which will be highlighted throughout the 2012-2013 school year in classrooms and with other smaller events, which have not been determined. Akiba’s uniqueness and the fact that it has been successful for so long is something to be honored, Silansky said. Akiba was founded by the late Marcus Rosenberg, with support from his wife, Ann; brothers, David Rosenberg and the late Manny Rohan; and friends, Sol Schwartz, the late Sol Prengler, the late Harry Goldman and the late Bernie Gerson. Marcus Rosenberg also received support from Joseph Kaminetsky, director of the National Society for Hebrew Day Schools. 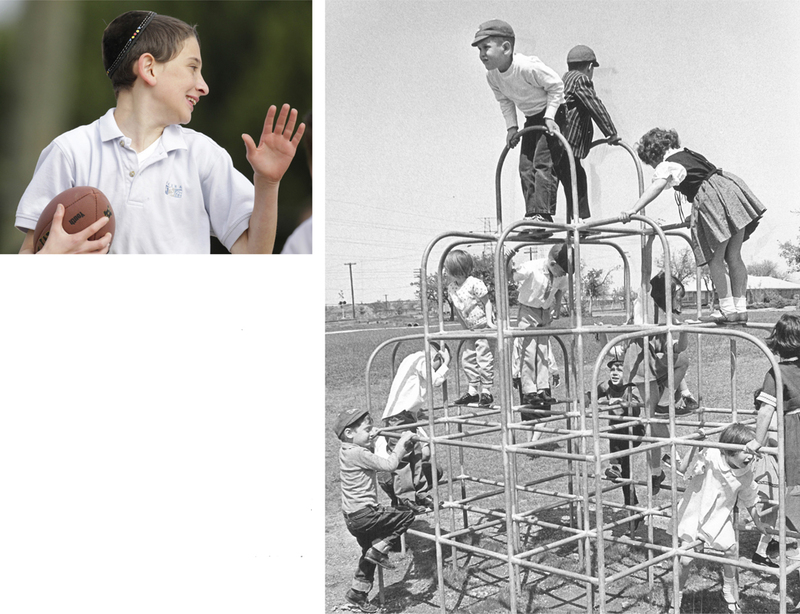 The idea for Akiba came about in 1960 when the Rosenbergs’ two children were entering preschool age and they wanted them to go to a Jewish day school, which didn’t exist at that time in Dallas. While a previous day school, Hillel Academy, operated during the 1950s, the community did not support it, and it closed in 1958. Akiba was first known as Preston Hollow Day School and was located inside a small home on Northaven Road in North Dallas. It officially became known as Akiba Academy in 1966 and in 1968 moved to a new building, on a lot of more than three acres, on Churchill Way. By then, enrollment was 150 students. Akiba moved to its current location, the Schultz-Rosenberg campus, in 2005. 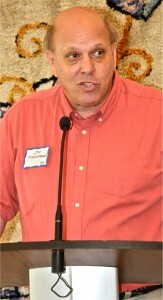 Rosenberg is an honorary chair of the 50th anniversary celebration, along with Leslie Schultz. She and her husband, Howard, and their children, Jaynie and Andy, are all past presidents. Jaynie, Andy and their brother, Dan, all attended Akiba, and so did eight of Leslie and Howard’s grandchildren. The continuity of the Dallas Jewish community and everyone working together is what Leslie Schultz said has lent to the success of Akiba and believes that what will take it into the next 50 years. Looking to the future, the hope is to continue giving Jewish children in Dallas a wonderful secular and Jewish education and giving them tools to succeed, Meyerovitz said. Tickets for the gala are still available and can be purchased for $180. From Oct. 21-26, there will also be a fundraiser at Zinga Frozen Yogurt, located at 18208 Preston Road, Dallas. One dollar from every purchase made will be donated back to Akiba; flyers are available to bring to Zinga. For information, call Jennifer Sutton at 214-295-3411. Q: How does it make you feel that the school is celebrating 50 years? A: Since Akiba came into being, it has transformed the Dallas Jewish community. Our founders understood that the key to the continuity of Judaism is to educate our children about their heritage. Q: What do you think has lent to its success over the years? A: Akiba is known to have an outstanding general studies department that prepares children for “the real world.” Our students have graduated from leading universities and have been very successful in their professional careers. Akiba engenders a love of Judaism through its hands-on curriculum that focuses on making Judaism come alive in real and practical ways. Children are taught how to connect Judaism to their every day lives. 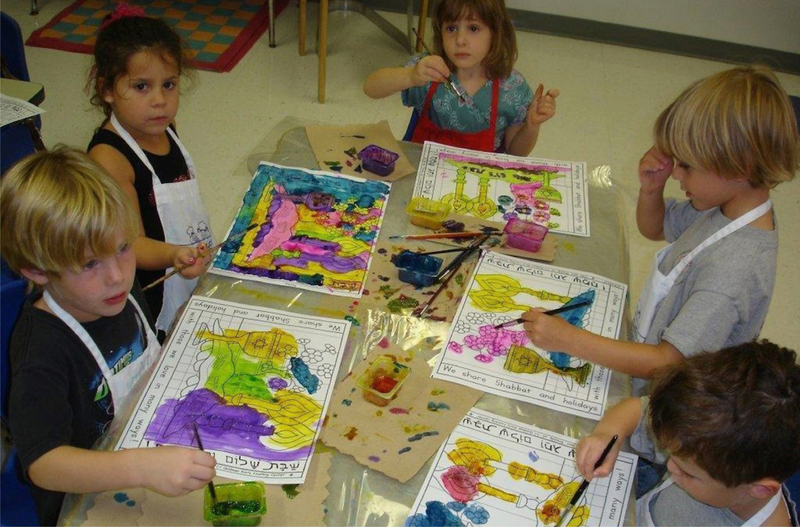 In our unique environment children not only learn about Judaism, they live it. Akiba inculcates within our students an Ahavat Eretz Yisrael, a love for the state of Israel. Through top-quality spirited programs, innovative educational programs, visits by prominent personalities from Israel and many other experiences, our students develop an appreciation and love for Israel. Q: How do you believe Akiba can be a model for other Jewish day schools? A: Akiba is very unique in that our students come from a broad spectrum of Jewish backgrounds and affiliations. It is an environment where children of all backgrounds come together and grow from each other. There is a tremendous amount of achdut (unity). There is also extensive connectivity, collaboration, integration and cooperation between the Judaic and general studies departments. Our very cohesive staff exhibits the kind of respect and unity toward each other that our students learn to model. Our staff is composed of people of all walks of life who learn and grow from each other and who exhibit genuine love, care and concern toward each other. Q: What are some specific highlights you have of the school in your time at Akiba? A: This is my 18th year at Akiba, my eighth as an administrator. During the past number of years, we have experienced unprecedented growth in our student population and families particularly with new young families (who are the future of our school). This is especially significant in light of challenging economic times when enrollment in many day schools nation-wide is down. We have a focused approach to bringing out the strengths in each and every child in a child centered environment; we focus on retaining top notch teachers and on recruiting new top teachers; our teacher retention rate in the year that we celebrate our 50th is 97 percent, which is very rare to find in any school; our teachers are constantly learning innovative ways to enhance the experiences that they give over to their students. We are up to date with new educational research and we implement new approaches and methods accordingly. Q: What do you see for the next 50 years? A: I see a bright future ahead for our school with a continued influx of young families coming to our school because it is and will continue to be a haven for top-notch educational experiences in a loving and nurturing setting. I am thrilled that some of my former students are moving back to town with the intent of sending their children to our school. This is very validating in that they want their children to experience what they experienced — and even better then that. Some of Akiba Academy’s past presidents share their fondest memories about the 50-year history of the school. Quotes supplied by Akiba Academy from school archives and recent interviews.